Skip Weaver|Aim Media Photo Houston’s Tristin Freistuhler (right) runs in the D-III boys race at National Trail Raceway Saturday. Skip Weaver|Aim Media Photo Houston’s Ava Knouff runs in the girls race Saturday at National Trail Raceway. Skip Weaver|Aim Media Photo Versailles’ Madelyn Holzapfel and Bradford’s Austy Miller run at the D-III girls race Saturday at National Trail Raceway. 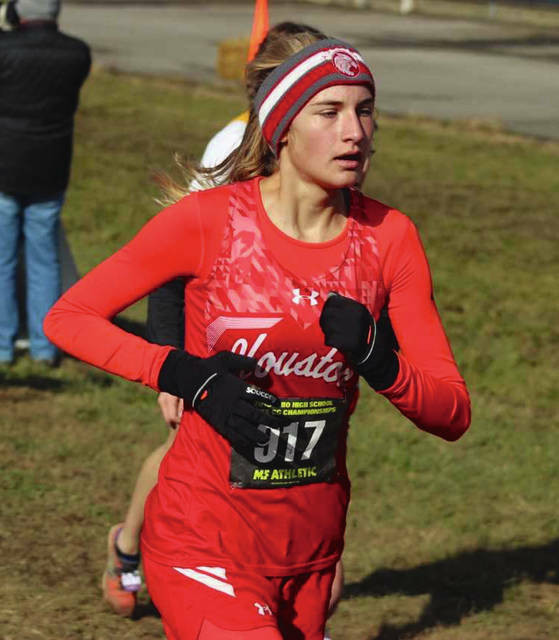 HEBRON — Bradford and Versailles girls, as well as Tristin Freistuhler and Ava Knouff of Houston competed in the state In the state cross country meet at National Trail Raceway Saturday. 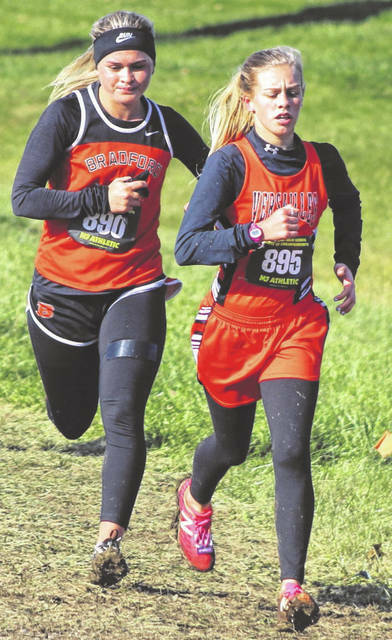 In the Division III girls race, Bradford totaled 299 points to finish 11th out of 20 teams. Versailles scored 370 to place 15th as a team. “I’m happy with how they did today,” Bradford coach Rob Grillot said of his six runners. “They went out there and ran hard and ran the best race they could with this cold weather and I am pleased with how they did today. Senior Karmen Knepp was the lead runner for Bradford placing 28th overall in a time of 20:13.2. She was followed by Skipp Miller (21:00.2) in 64th place, Austy Miller (21:23.7) in 81st place, Olivia Daugherty (22:110.1) in 120th place, Mercedes Smith (23:17.8) in 153rd place and Alexis Barhorst (24:47.5) in 172nd place. The Railroaders, who qualified as the third-place team at the regional meet two weeks ago, hope to make this an annual event on their schedule. That is something the Versailles girls have been doing for a while. The Tigers competed as a team in Saturday’s state meet for the 17th time overall. It was their second straight and 15th time since 2000. The Tigers top placer was freshman Madelyn Holzapfel. She was 84th in a time of 21:29.1. She was followed by sophomore Maria Mangen (21:50.5) in 105th place, senior Liz Watren (22:04.2) in 112th place, senior Kara Spitzer (22:14.4) in 123rd place, sophomore Lauren Menke (22:41.3) in 140th place, freshman Delaney Barga (23:36.1) in 158th place and junior Emma Peters (23:47.5) in 160th place. “Our team is very much a pack running team,” Pleiman said. “We don’t have the frontrunner so a big meet like this makes it difficult for us. A lot of points go off the board before our first runner comes in, but overall it was a fun experience. The girls love it and I love coming here every year. 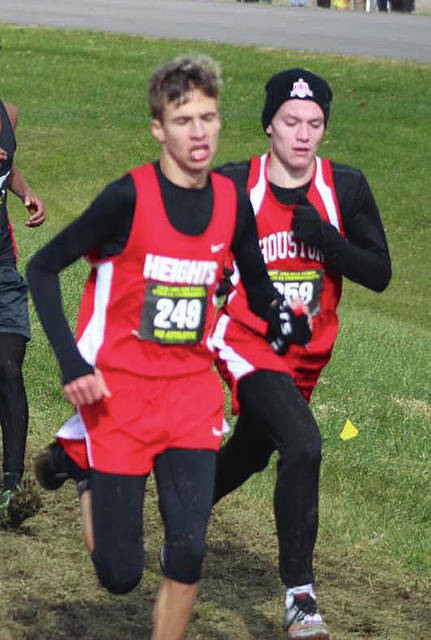 For Houston, Feistuhler finished 81st in 17:52.7 in the boys race and Knouff finished 83rd in 25:21.1 in the girls race. https://www.dailycall.com/wp-content/uploads/sites/30/2018/11/web1_tristin_ne20181111181123625.jpgSkip Weaver|Aim Media Photo Houston’s Tristin Freistuhler (right) runs in the D-III boys race at National Trail Raceway Saturday. https://www.dailycall.com/wp-content/uploads/sites/30/2018/11/web1_ava_ne2018111118112676.jpgSkip Weaver|Aim Media Photo Houston’s Ava Knouff runs in the girls race Saturday at National Trail Raceway. https://www.dailycall.com/wp-content/uploads/sites/30/2018/11/web1_Madelyn-and-Austy-2_ne2018111118112898.jpgSkip Weaver|Aim Media Photo Versailles’ Madelyn Holzapfel and Bradford’s Austy Miller run at the D-III girls race Saturday at National Trail Raceway.